The Nintendo 3DS console went on sale in the UK last week, with a number of supermarkets here in the UK selling it at a discounted price, which ended up being cheaper than many specialist game retailers. 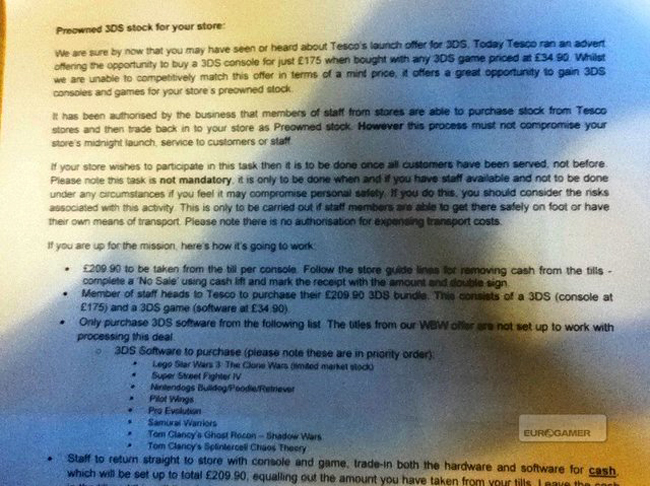 It seems that one UK retailer, though it was a good idea to send their employees out to the local supermarket to purchase as many 3DS consoles as they could so they could sell them to their customers, according to a leaked internal document obtained by Euro Gamer. The retailer in question is GAME, one of the largest specialist gaming retailers in the UK, who were selling the 3DS console for £219.99, and the supermarket was Tesco who were selling the 3DS console for £175 when the customer purchased a game for £34.90 making the total cost of £209.90. GAME told its employees to purchase 5 of these 3DS bundles at once for a total cost of £1,049.50, from cash obtained from their cash registers, GAME then intended to sell the consoles to customers as pre-owned consoles once they had sold out of their 3DS stock. GAME have spoken to Eurogamer about what was done to obtain extra consoles from supermarkets and had the following to say about it. “Some of our stores wanted to move quickly last weekend to build their pre-owned stocks of 3DS at the same time as their local competitors, so we gave them a process to do that.